[Please to enjoy another fine edition of You Are There by Jalopnik stringer and Lime Rock denizen, James Gribbon.] The cloudiest part of this past Labor Day in rural Connecticut was my head. I was winding down after a long weekend, which was ending on a high note. I was entering Lime Rock Park for the Rolex Vintage Festival. The Gatorade was helping too. I heard a distant rumbling that made me raise my head. Just then, a maroon BMW M5 pace car wheeled into view and I heard a Ferrari bark as the driver blipped the throttle. Then, there were dozens of Ferraris, Alfas and a lone Fiat, all emerging from behind the trees to take their parade laps. Not many things can get gluey blood flowing better than a cacophony of Italian engines. My half-lidded eyes opened wider. This was going to be a good day. I walked across the bridge to the paddock and it was like I crossed over into a sculpture garden for gearheads. Open wheel racers lined up on either side, but a Bugatti T-35B in that blue pulled me toward it like gravity. The eight wide spokes on its wheels gleamed, and the grease that lubricated its leaf springs was so clean it could have been olive oil. 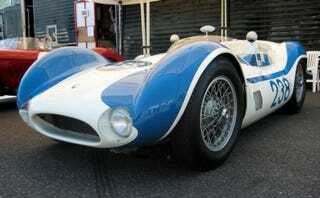 My eyes raked an Alfa Romeo Volpi Special and fell on the drivers' names painted on the body: "J. Fangio." Oh. Right, then. Depression-era sprint cars squatted under tents on my right, and the hoods of two Lotus Elevens stood up to my left. Every ten steps there was another million-dollar car, and this wasn't the concours day. These were here to be driven. I thought about what it'd be like to drive Fangio's car until it made my head hurt. I rested my searing eyes on a pair of Maseratis, a '55 300S and a '60 Tipo 61, which is one of the most beautiful cars ever made, racing or not. Go to the gallery and check out the "Birdcage" frame, made of hundreds of narrow tubes. The open wheel cars took to the track in their Pre-1941 Sports and Racing Cars class (Group 1) and the ex-Fangio car won in a rout. There's something about seeing a three-wheeled Morgan running in this crowd with a rainbow colored spinner trailing off its teardrop tail that has to bring a smile to your face. This just in: old cars cure hangovers. The drivers really went at it in Group 2, a '52 Allard K2 with a Caddy motor sounds remarkably like a stock car roaring down the front straight, being chased by a herd of XK-120s who weren't afraid to mix it up, loop it, take it into the dirt, and jump back out into the action. The organizers played it equally fast and loose with the rules - there's no way a six-plus liter Allard is in the same class as an MG TD. But it's about seeing them on the track, about showing the life that's in these antique machines. Stanguellinis, Brabhams and a Lancia-Pagrada duked it out next in a Formula car race. My money was on a BT-2, but a Cooper ended up taking the checkered flag. It was a ton of fun watching a Fiat Abarth give hell to the Group 5 cars, but it was a Porsche 356 that crossed the line first. My second favorite race of the day went to a battle in Group 6 between a '58 Allard GT with Chrysler Hemi power and a '59 Aston Martin DB4/GT. It was like watching an AWD car in the wet, the way that Allard pulled away from the pack once the green flag dropped. The Allard was quickly dogged by the DB4 and both were caught, lost and caught again by a '64 MG B with a hell of a driver. Three Ferrari 250s didn't even have a chance. The nimbleness of the Aston Martin was to prevail in the end, but the MG driver may have gotten the loudest applause from the crowd. A team of two beautiful XKEs abused a field of Mustangs and Corvettes while a Se7en (much to the delight of Jalop super-commenter Al Navarro, I'm sure) diced through the V8 beasts and took home third place behind the Jags. Now, ladies and sunburned gentlemen, it was Can-Am and IMSA GT time. I could hear them fire up from my seat on a hill across the track and I just started giggling. I'd seen the rows of Chevrons, the GT40, T-70, the two Monzas, and all the rest earlier in the day. Their owners may have been playing with grandkids in the shade, but these cars were all ready for battle - all wedges and jagged ranges of intake trumpets. God, I couldn't wait to see them thrash around the course. The #20 '76 Dekon Monza was on the pole and leapt off the line, its enormous rear wing seemed to be waving bye bye to the rest of the final group. The sports racers were going to have something to say about that. The Chevrons and a Royale crept up over the course of the race. Spectators on the inside of the track got a show as a 914-6 lost the back end coming down the diving turn before the front straight, executed a full 360, and hammered back on the gas to continue racing. A Chevron B19 was nothing but bare, dull metal with a single, black "3" on either side. It was just a grey doorstop flying around the course and it looked like a cheap toy. It also went on to win the biggest race of the weekend. In true racer fashion, that car had nothing on it that didn't serve a purpose.